Everyone Needs a Titanium Spork! GearGuyd > Gear > Everyone Needs a Titanium Spork! 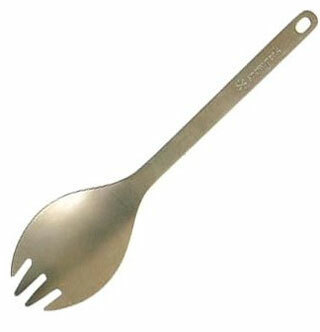 No longer exclusively used by hikers, soldiers, gamers and college students, titanium sporks are becoming hugely popular. The fact is, everyone could use one. These handy utensils are lightweight, durable, and are great for camping, chowing down at the office, keeping in the car, or even just eating on the go. Embarrassingly, I have never had the pleasure of eating a complete meal with a titanium spork. Don’t worry, something is being done about this – I ordered a Ti spork, and it should be arriving this week. Until then, I’ll just have to man up and continue suffering through the use of metal or *shudder* plastic utensils. Titanium sporks are sold at outdoor and sporting sporking good stores as well as geek gadget/gizmo retailers for about $9-12.